The beautiful long stem roses so popular at florists are not in a class by themselves, they are in fact Hybrid Tea Roses. These are derived from a blend of the hybrid perpetual and the tea rose. Each individual bloom can have as many as 50 petals. 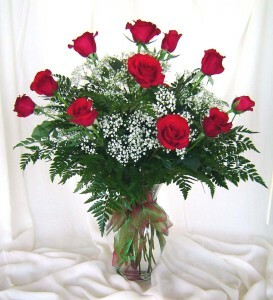 Most long stem roses flower continuously throughout the growing season and can attain heights of 6 feet and more. Because they have been bred with the goal towards long stems, much of their fragrance has been lost. However, you can nevertheless find some varieties that have retained that wonderful rose scent. Plant your long stem roses in the same manner as any other rose, keeping in mind that they should get 6 hours or more of sunlight as well as good air circulation. Moderately hard pruning should be done in late winter or early spring just as new growth begins. Remove old, broken, dead or damaged canes from the center to let in fresh air and sunlight, leaving the thick healthy outer canes forming a shape roughly like a vase. Prune these remaining stems down to 24 inches or a little less, leaving at least 3 or 4 healty buds on the cane. Make the cuts on a 45 degree angle, just above an outside facing bud so the new growth will develop outward. Fresh cuts should be sealed with a product designed for the purpose. However, you can use ordinary wood glue such as elmers. It works just as well and is inexpensive. Once blooming has started, make it a habit to dead head the spent flowers. Cut the stems down to the first 5 segmented leaf that has an outward pointing bud and chances are you will see another blossom during the same season. About 2 to 3 weeks after this yearly pruning, fertilize with a good fertilizer made for roses. Continue periodic applications according to package instructions, with the last feeding about mid August. You do not want new growth at this time because the plants are getting ready for their rest period. These roses are very thirsty and a mature plant will need a good 2 inches of water per week. Water the roots - not the foliage - preferably early in the day! A good thick mulch will help retain moisture and keep down the weeds. Long stem roses are somewhat more prone to disease than their hardier and more robust parents and cousins. Be sure to adopt a regular spraying program before problems appear. If you live in an area of harsh winters, you should protect your long stem roses by tying the canes together and mounding the plants with soil. Cover the mound with a thick layer of leaves, pine straw or straw and contain the whole thing with a cardboard or burlap cylinder. If you use cardboard or other solid material, punch a few holes so that some air can penetrate. If you are successfully growing other varieties of roses, there is no reason not to try some long stemmed beauties in your backyard garden. You will have the pleasure of fresh cut roses in your home or to give as lovely surprises.